L: 20.5" x W: 25" x H: 40.5"
Logan Dining Chair The Logan dining chair features a rich finish, clean lines and precise detailing, so you can achieve a polished, sophisticated appearance in your dining room. It's covered in linen-look upholstery and features a broad back to help you get comfortable. The Logan dining chair features a rich finish, clean lines and precise detailing, so you can achieve a polished, sophisticated appearance in your dining room. It's covered in linen-look upholstery and features a broad back to help you get comfortable. Frame joints are reinforced with corner braces, heavy-duty metal fasteners, screws and glue for added strength and stability. Dining chair features a polyurethane-foam-padded seat and back, while linen-look upholstery composed of 100% polyester provides a beautiful finishing touch and extra comfort. These chairs are sturdy and comfortable. The linen look of the fabric makes them look chic and the colors blend well. Love to sit on this chair! When we got this chair, all was great! Fabric is great and matches the whole house. We played a card game the first time using this set and sat for 3 1/2 hours. Both my husband, myself and our two friends all loved these chairs. Very comfy. Love it, love it! We paired 2 of these chairs with the fenwick dining set and they look amazing. I couldn’t have asked for a better pairing! We have gotten so many compliments on them and not to mention they are super comfy. Great product, great service and delivery. Like sitting on a piece of heaven! Looks great and hope it will last. Comfortable and really nice looking! We shopped all over, but these chairs are perfect for our new kitchen. If you look at the Marble top table....Yes the marble top is brown....However, it does have grey in it too. They are so comfortable work with any table Piece!!! Classy and comfortably chairs look amazing with the dark table. Just out some felt tips on the bottom of the legs if you have hardwood floors to prevent scratching of you have kids or heavier adults using them. Good support with generous seat support. The only negative is the lack of option for a bench style seating. The chairs were nicely packed, two in a large carton. The pieces seem well made and all the required pieces were included. The supplied wrench worked but took a long time to tighten the screws so my husband switched to power tools. The chairs look very nice although the upholstery on the seat could be a little tighter. The chair cushions seem rather firm. Most dining chairs are hard and uncomfortable, but the Logan chair is soft compfortable and attractive. Comfortable, easily slide on the tile floor, nice. They support the back ok, could be better. When delivered one of the legs of the chair was uneven, the driver came back hours later to fix it. When you sign off for the chairs be sure it does not wobble. But I like it. I ordered 6 chairs and they look great-a definite step up from small wooden ones i had before. Gave 4/5 stars bc two of them were assembled poorly n wobbled. I told the delivery men n they tried to convince me my floor was just uneven. I moved a good chair to the same spot to prove them wrong. Didn’t appreciate their shadiness in that moment but I stuck to my guns n they ended up taking those two n delivered two new chairs that did not wobble so I am completely happy with the purchase in the end. Attractive chairs with a contemporary look. The chair is comfortable and I like the height of the back. I'm not sure how long they will last, hopefully for years. The seats are much harder than the ones in the showroom; I've been told I need to break them in for about a month, although I've never had to do that with dining chairs before. The chairs also do not slide well on a kitchen floor, even with felt pads underneath. I'll keep using them for a month to see if they become more comfortable; if not, I will be calling my store. when seating all the way back, it feels like not stable at all. It almost feels like the chair will break. They look stable but when seating it feels unstable . We just purchased this dining set to furnish our new apartment and we are so happy we did. It’s a great set with simple style and decent quality. 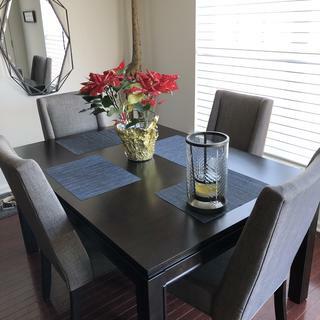 It was perfect for us as our first dining set. We would recommend this to others. Easy to put together and overall easy to transport. What is the weight capacity of these chairs? Is this chair available in a set of 2, 4 or 6 ? BEST ANSWER: Hello Shenia, thank you for your interest in the Logan Dining Chair! The chair can only be ordered individually or in a dining set that includes a table with you choice of 4 chairs or 6 chairs. Do these chairs come in different colors? BEST ANSWER: Hello Geraldine, thank you for your interest in the Logan Dining Chair! The fabric is only available in Gray, as shown on the website. Is the color. Of the linen gray ? BEST ANSWER: Yes. The color may be referred to as a linen-blend gray color. What color is the legs of the chair? BEST ANSWER: The legs of the Logan Dining Chair are a very dark brown.